“When someone shows you who they are, believe them” – Maya Angelou. It’s not surprising to learn that Maya Angelou was an Ivory Joe Hunter fan. Both had a way with words and she was the perfect age in the late 1940’s – and in the perfect place, San Francisco, where Hunter spent time – to be swept up in Ivory Joe’s first brush with success as an artist. The quote adorning the top of this review however normally refers not to music but to more odious behavior, as Angelou was chiding those who are prone to excusing someone’s deplorable words or actions, or trying to convince themselves that those glimpses into somebody’s darker side are not an accurate reflection of the person’s true attitudes and beliefs. But of course it is. People are who they are and generally speaking they merely put up a public front to hide their opinions on a subject if they think their actual viewpoints will result in derision. Of course they can’t always mask that contemptible behavior and so when their true nature seeps out, usually followed by insincere apologies and far-fetched excuses when the inevitable backlash occurs, it’s always best to simply trust who they showed themselves to be before they were aware they would be so closely scrutinized. What does this have to do with Ivory Joe Hunter, a genial, affable, soft-spoken and humble pianist, songwriter and singer, someone who never raised a fuss, who never criticized anybody and who was friends with everyone from jazz great Ben Webster and blues star Pee Wee Crayton to country icon George Jones and The King of Rock ‘n’ Roll, a fella named Elvis Presley? Well, Ivory Joe Hunter spent his career showing us the type of artist he was – a skilled craftsman whose forte was ballads with melodies that worked their way into your brain and vocals which rarely ever rose above a soothing croon. But many in his audience, or at least those of us in the current era looking back at his career, constantly hoped he’d give us something with more restless urgency, that somewhere along the way he’d shed that polite mannered façade to reveal somebody with more fire, more toughness… maybe even a wild hell-raising side of his persona that was secretly longing to get out. But he hasn’t done so yet and with few exceptions never really would in the future either, showing why Angelou’s words (as always) ring true. When Ivory Joe Hunter showed you who he was, a mild and eminently pleasant singer, we should’ve just believed him instead of always wishing for a little bit more. The odd thing about Ivory Joe Hunter, and maybe the reason why there’s some frustration around these parts with his mellow persona, is that in most other ways he was very diverse musically. Yes, he tended to lean towards ballads more than uptempo ditties, but within that basic structure he explored many different types of music. He cut sessions with some of the top jazz musicians in the business, then he’d turn around and offer up something in more of a cocktail blues vein the next time out. Recently he began using violins and delving into country music motifs long before anyone else in rock had the mind to, and so with all of those influences factoring into his approach it’s telling that the one thing which never seemed to change in his songs was his perspective as a human being. To put it simply Ivory Joe Hunter was decidedly non-confrontational in almost every single song. Whether he was dealing with the harsher side of life as a whole or when confronted with a two-timing woman, as here on Landlord Blues, Hunter was always the kind to turn the other cheek, to walk away from every fight, to endure each insult with a passive response and to dwell on every slight in the privacy of his own room, looking for reasons as to why he himself might actually be partly to blame. That mindset however runs counter to the dominant views held in rock ‘n’ roll, a confrontational, almost belligerent form of music that met every challenge with a more emphatic response. Or at least that’s the image rock hangs its hat on and so for Hunter, who was anything but that kind of artist, his ongoing success in the field could seem sometimes inexplicable. Making his success all the more unexpected was the action of his record label, King, which on the surface seemed to be merely winging it when it came to properly gauging the marketplace and determining what was currently in favor and what they had to satisfy those needs. Case in point is this very record, Landlord Blues, a song which not only seemed to put him at odds with his fellow artists when it came to the image you wanted to present but also was something which had been cut two years earlier in the mad rush of sessions to give them enough material to get through a prolonged recording ban. To pull it from the vaults now, even though like many of those sides cut back then it suffers from the sense he hadn’t quite had time to flesh it out completely, was utterly baffling. Maybe as a B-side it could be reasonably excused but this was in fact issued as the A-side following some of Hunter’s biggest hits to date. Talk about self-sabotage, this seemed like shooting yourself in the foot and then sticking that wounded foot in bacteria-laden soil to all but ensure infection. So of course it promptly became a Top Ten hit itself. Who knows, maybe they did know they were doing after all. No matter how generous one is when assessing Hunter’s output though this two year old leftover doesn’t stir any strong defense of it as a potential hit even if that’s ultimately what it became. Landlord Blues is a good idea done in by two factors, the first is Hunter’s own attitude when confronting the situation he offers up within. Let’s start with the fact the lyrics aren’t directed to the landlord in the title at all, but rather his woman – wife or girlfriend, he doesn’t specify, but they are obviously cohabiting which is the gist of the dispute between them. It seems that when Ivory Joe is out of the apartment each day during working hours the landlord is occupying his woman’s time – and for that matter her bed – in his absence and Hunter is understandably perturbed by this news. This in spite of the fact that he’s sometimes getting a break on his rent because the landlord presumably either doesn’t have the nerve to show up asking for it when he’s been banging Hunter’s gal, or because the girl is using their tryst as a bargaining chip to keep from having to kick in her fair share of the money. But rather than fly into a rage, grabbing a baseball bat or butcher knife and heading to the landlord for a confrontation as you’d expect from most guys who ply their trade in the rock biz, Hunter is stewing about it in his easy chair or at the dinner table, too timid to even have it out with his girl directly and so he merely drops some hints regarding the gossip he’s been hearing and tells her that if it is true he’d appreciate it kindly if she stopped it. Though we don’t HEAR her response I can tell you exactly what that response is. She’s offering a flippant denial of it without even bothering to hide the fact her blouse isn’t buttoned properly and the bed has mysteriously gone from being neatly made this morning before Ivory Joe left for work to having its sheets rumpled by the time he came home. She’s smiling condescendingly at him during all of this, serving up his supper while laughing inside at what a sap he is. So what if he finds out, she tells herself, HE’S not going to do anything about it. Not Ivory Joe the pacifist. Oh, he’ll seethe a bit, shame and anger mingling in his aching heart, but in the end he’ll let it go because that’s just the kind of guy Hunter is. As long as he doesn’t actually see them fornicating with his own eyes he’ll swallow his pride and not throw her out… or throw the landlord out the fourth story window. But what’s to prevent the rock ‘n’ roll fan from throwing Hunter out with the coffee grinds and egg shells from breakfast if he keeps giving us more of these weak responses to genuine grievances? Why would an audience who’ve had their dignity trampled upon by society as a whole for most of eternity and who were only now beginning to show signs in popular culture that their acquiescence to this type of treatment was no longer acceptable, why would THEY of all people allow Hunter to remind them of the days when meekly accepting life’s indignities was their only option? Besides, it’s not as if the story he’s spinning is rife with clever plot twists to distract us from his own shortcomings when it comes to intestinal fortitude. Maybe if he lets slip that the landlord’s own wife was sleeping with Ivory Joe when he supposedly “went to work” each morning, thereby flipping the tables on the bedroom double dealing, that could be worth the price of admission alone. Instead we get no such thing as Hunter merely lays out the barest minimum of details and leaves it at that. There are no witty verbal put-downs or sudden back and forth sparring between this couple to make it interesting enough to bother eavesdropping through the walls from the apartment next door. In other words it’s as bland as dry white toast, which I believe is the second or even third time we’ve used that description on this site, all of them for records by one Ivory Joe Hunter. Which brings us to the other factor that makes the positive reception for Landlord Blues so bewildering in the late summer of 1949… namely that this is the sound of late fall 1947. It was cut in Nashville of all places with a guitarist named Owen Bradley among the participants. Bradley was 32 by now and had gotten some recognition as a songwriter in addition to leading a society band, but was just now starting to transition into production work which is where he’d make his name throughout the next two decades as one of the foremost architects of the Nashville country sound. In fact you might argue that Bradley’s eventual concept for the Countrypolitan sound which took the hillbilly aspects out and replaced them with piano and strings and more of a pop appeal, came from Hunter’s records such as That’s The Gal For Me. Instead it relies on Hunter’s choppy piano, ironically the one aspect of it that does show a some annoyance at the goings-on described in the lyrics, but even that doesn’t rise to full-fledged anger at any point. Mostly the piano sits starkly naked in the arrangement which gives some sense that this was almost a glorified demo session in some ways. We haven’t gotten to hear much of Ivory Joe banging on the ivories too often in our travels so far and while it does constitute the most rousing part of the record it’s also something which sounds as if it were only a dry run to something that would be bolstered by more instruments in a fuller arrangement. But while those other instruments were indeed present – full horn section, bass, drums, etc. – none of them are given much to do. The first thirty seconds are virtually all Hunter who’s laying down his best work within on the keys before the horns make their presence known. Even they add little more than ambiance, contributing nothing too menacing to give this any sense of genuine to heighten its appeal. There’s a few interjections with the horns and drums trading off but it’s so unwieldy that you get the idea it’s a seventh grade band that has been practicing that one part for weeks for the big recital in front of their friends and family and while they all clap proudly that it comes off without any notable mishaps, it’s still far too rudimentary to receive any praise on a professional record by a huge star. As it goes along you just waiting and waiting for the other shoe to drop – a lyrical payoff that you didn’t see coming or an instrumental break to shake things up – but you’re still waiting when the record ends and as a result you’re left scratching your head that any of this was deemed a salvageable relic to present to the public as if it were new and vital. That the public felt it to be just that anyway is either testament to Hunter’s overall popularity or to the audience’s sometimes inexplicable tastes. Like with almost every other failed Hunter excursion there’s nothing to be found that will make you cringe – his lack of backbone for standing up for himself when being cheated on nonwithstanding – as his singing is pleasant, his playing is competent and his professionalism is modestly admirable. But records like Landlord Blues are why that even for all of his success Hunter is bound to be elbowed out of the way when it comes to determining just who among the rock stars shines brightest in the sky, even as his track record of hits would demand that he be included in that conversation. The ironic thing is of course that Hunter himself would probably expect that and not even raise his voice to protest his exclusion from the discussion of rock’s biggest names. That’s who he is after all, he’s shown us this lack of assertiveness enough by this point that we might as well believe him. 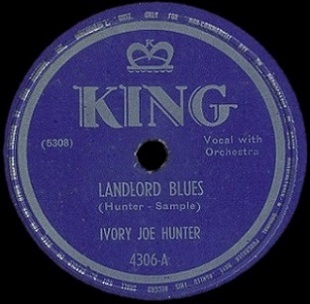 Leave a reply on "Ivory Joe Hunter: “Landlord Blues”"